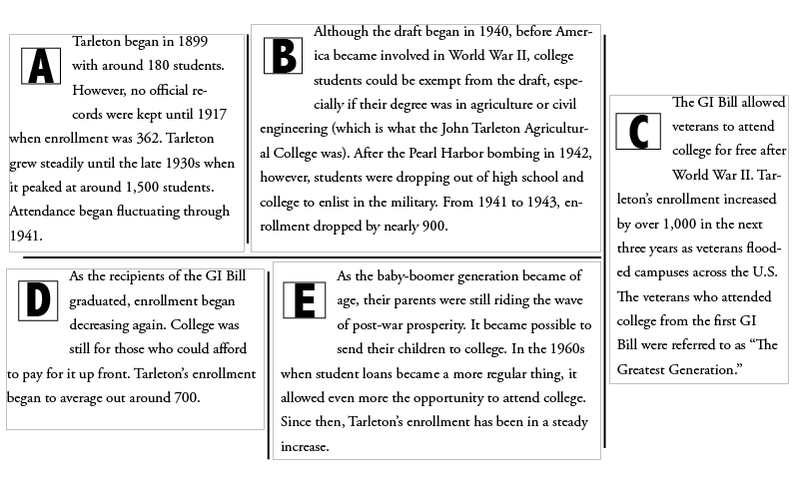 Tarleton’s enrollment in 1917 was 362. Today, 11,593 students are enrolled. Over the next five years, officials are hoping enrollment reaches 15,000. Historically, Tarleton has grown in its 116 years. 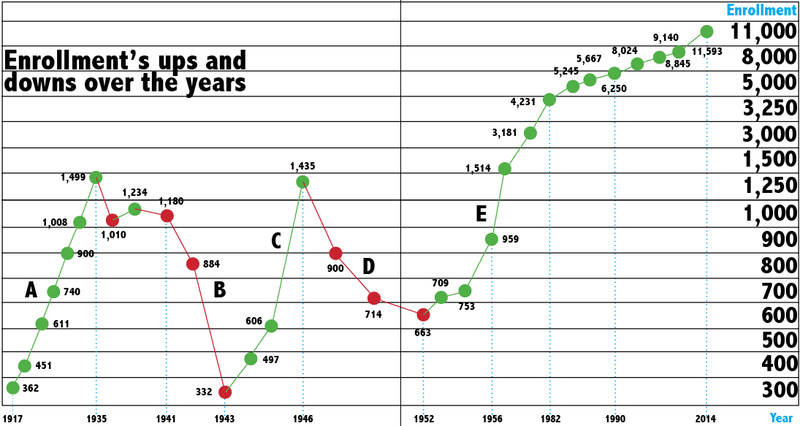 However, events in history have affected student population size. Until student loans became a common thing in the 1960s, world events and wars rarely affected attendance. College was for those who could pay for it upfront, and in many cases, college students could be exempt from the draft provided they maintained a decent GPA. Tarleton records supports this as enrollment rose during World War I despite the draft. The dip in attendance during World War II can be attributed to how much the war itself affected the American mentality. For the first time, people were seeing video updates of the war on a regular basis at their local movie theatres. Goods were being rationed and women were given the vital role of manufacturing and running many parts of the country. The United States was a war machine and almost everyone was doing something to help out of obligation or conviction. War was romanticized through photos, cartoons, songs, movies and other types of propaganda. It is no surprise that the attendance at Tarleton (at the time John Tarleton Agricultural College) dipped from 1,180 in the fall of 1941 to 332 in the fall of 1943. As the war progressed, President Roosevelt introduced the GI Bill of Rights, giving veterans a chance to go to college for free. Suddenly, the “greatest generation” flooded college campuses across the country to take advantage of their benefits. Tarleton’s attendance in the fall of 1946 was 1,435, the highest it had been since 1935. Tarleton was not ready for the influx of students. According to archived photographs of Tarleton in the late 1940s, attendance was so high and accommodations so limited that over a dozen mobile homes were parked on campus for veteran housing. Still, though, except for veterans, a college education was too expensive for the common man to pursue. As the recipients of the bill graduated, Tarleton’s attendance declined. In 1956, Tarleton began growing again. Still riding the post-war wave of prosperity, the baby-boomer generation began to grow to college age. Since then, Tarleton’s attendance has been in a steady incline. Even as the Vietnam War raged on the other side of the world, college attendance did not decrease by much because, again, many college students could get exemptions from the draft. 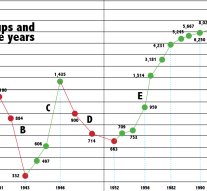 At the turn of the century, Tarleton’s enrollment was around 7,500 and has grown continuously since then. The opening of the satellite campuses has helped accelerate Tarleton’s growth as well. The university also is actively approaching landowners at the fringe of campus to inquire about their interest in selling to the university. This process is time consuming but will provide parking near campus as lots are acquired. Battson says the university is planning to build additional student housing to enable all freshmen and sophomores to live on campus by the fall of 2016. The plan calls for campus infrastructure improvements to create additional pedestrian malls and walkways that will enhance both the campus aesthetics and its walkability, also stating that parking will move toward the edges of campus. Tarleton officials hope to have 15,000 total students enrolled at all campuses—in Stephenville, Fort Worth, Midlothian and Waco—by 2020 and hope to see even more growth when the Forth Worth campus is open.